Super Bowl Trailer Twitter Buzz: Cool comparison of the amount of tweets there were for each trailer that aired during the Super Bowl last night. I was expecting Captain America and Tranformers to be quite high, but Thor? Hadn’t wee seen most of that trailer already? And how can Drive Angry And Fast Five have created more buzz than Super 8? Dancers Among Us: Photography project featuring dancers in everyday situations in New York. Some of this shots are amazing; I marvel at the skill required to pull off some of those poses! Internet Movie Poster Awards – The Not So Serious Categories: LOL. 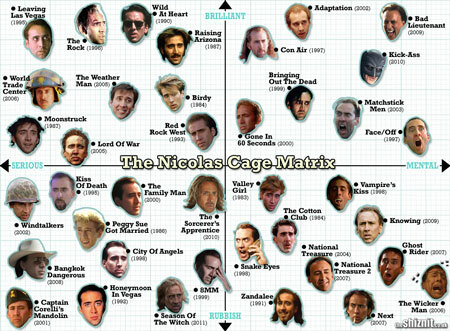 The Nicholas Cage Matrix: Nicholas Cage… you can’t really compare him to other actors. Sometimes he’s so over the top awful and sometimes he’s over the top brilliant; you always have to wait to see per movie which way it can go. This graph is a cute visualization of Cage’s movies. London’s Labyrinths and Mazes: I really should try to visit some of these. Mazes are like cool. Race Tracks Of The World: I’m not that much of a racing fan, but these wooden race tracks would look great on any wall. 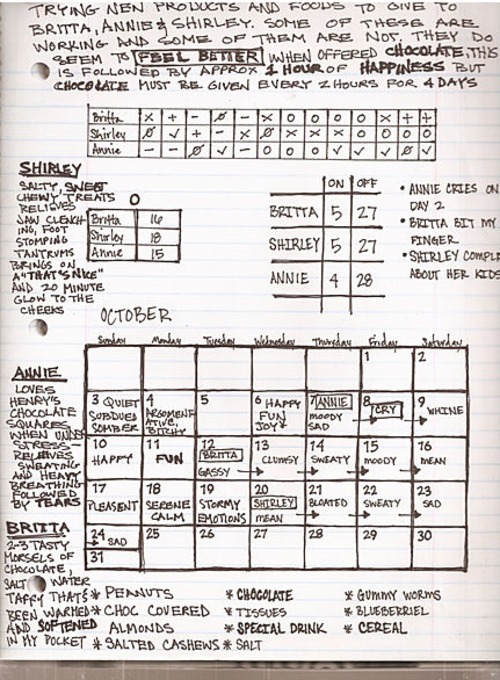 Abed’s Chart: Remember that Community episode where Abed tries to figure out the girls menstrual cycle and feed them chocolate according to mood. Yeah, he actually made a chart. Assassin’s Creed 2 Puzzle and Codex Analysis: I’m loving Assassin’s Creed 2! I wasn’t expecting this game to be so full of historical facts (I actually feel as if I’m learning something from playing this game). One of the interesting side missions has you searching for special glyphs on the sides of important buildings (like the Ponte Vecchio in Florence or the Torre Dell’Orologio in Venice) which lead to cryptic puzzles. 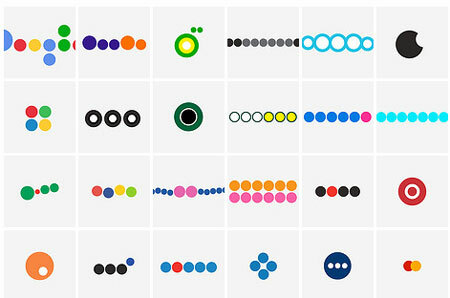 The link I shared contains quite a deep analysis of those puzzles; interpreting the things we sort of find out there and explaining in more detail which historic figures are mentioned.